Double-contrast left posterior oblique view of the stomach following partial gastric resection with anastomosis to the duodenal bulb. Figure 3.2. Billroth II. Double-contrast supine view of the stomach following partial gastric resection with a gastrojejunostomy. There is filling of the efferent limb and a small portion of the afferent limb. 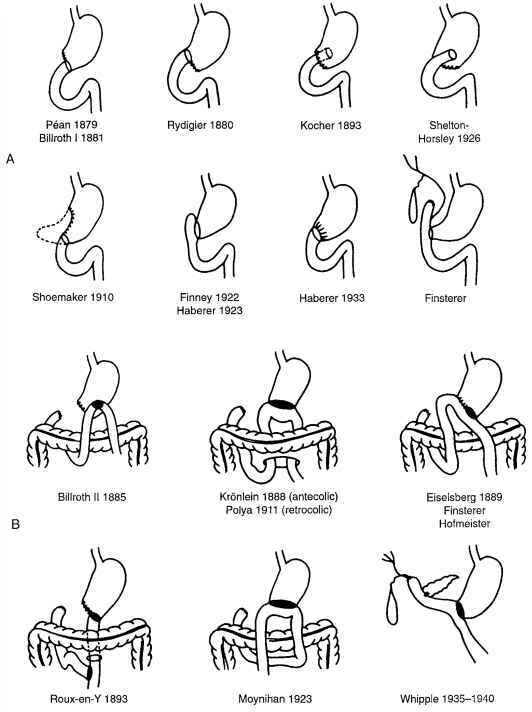 establishing gastrointestinal continuity after gastric resection, many with eponyms attached. To highlight the confusion in terminology, he brought attention to the fact that the "Polya" procedure had been performed earlier by 11 different surgeons, including Hofmeister, and the "Hofmeister procedure" was first performed by Eiselsberg. The Billroth I was in fact first performed by Pean and bears his name in some countries. To avoid confusion, descriptive terminology, rather than eponyms should be used. Burhenne has outlined 11 basic components of gastric surgery  (Table 3.1). The extent of gastric resection will depend on the indication for surgery (i.e., malignancy, benign tumor, or PUD) and the surgical objective (e.g., removal of the gastrin-producing portion of the stomach). The anastomosis may be end to end, end to side, side to side, or side to end. It is now customary to perform an end-to-side anastomosis with a Billroth II. In relation to gastrojejunostomy, the terms "anterior" and "posterior" refer to the position of the jejunal anastomosis with respect to the anterior and posterior walls of the stomach. The anastomosis is not always made to the cut end of the stomach; indeed, it may be at a separate area distinct from that site. The jejunal anastomosis may also be either antecolic or retrocolic. With the antecolic anastomosis, the jejunum is anastomosed to the stomach anterior to the transverse colon, whereas the retrocolic anastomosis is performed posterior to the transverse colon through an incision in the transverse mesocolon. Table 3.1. Basic components of gastric surgery. Figure 3.4. Hofmeister defect. 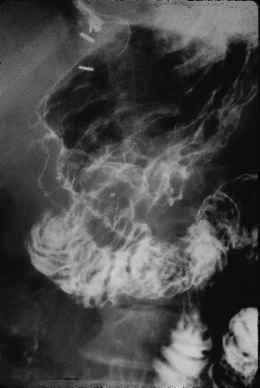 Supine film from an upper GI series demonstrating a defect along the lesser curvature of the gastric remnant corresponding to the closure line of the invaginated cut surface of the stomach. defect corresponds to the closure line of the invaginated cut surface of the stomach. Six out of 100 cases with this repair demonstrated this defect in one study . It is important to recognize this as a postsurgical deformity, not to be confused with pathology, such as neoplasm. The defect is generally best seen in the early postoperative period and often decreases in size or disappears on subsequent examinations. It may appear as an ovoid, spherical, smooth, or lobulated defect up to 5 cm in diameter on the lesser curvature of the gastric remnant just above the anastomosis. Postoperative baseline studies are helpful in this regard, because this defect would not develop at a time distant from surgery, and in fact may decrease in size or disappear with time. The terms "isoperistaltic" and "antiperistaltic" have been generally discarded because they have acquired different meanings, producing confusion and controversy. The terms "right to left" and "left to right" have replaced "iso-" and "antiperistaltic," and indicate that the A loop is located on the greater curvature (right to left) or the lesser curvature (left to right). This decision will be based on the patient's body habitus and the surgeon's preference. A complete interpretation of the radiographic appearance of the postoperative stomach should include, where appropriate, estimation of the extent of the gastric resection, the type, position, direction, and orientation of any anastomosis, evaluation of the stoma or channel diameter, contour and location, and an assessment of the speed, direction, and completeness of gastric emptying [8,10]. The various types of pyloroplasty include Heineke-Mikulicz, Finney, and Jaboulay, with the former being the most commonly performed. Pyloroplasty is a drainage procedure intended to widen the pyloric channel and therefore facilitate gastric emptying. In the Heineke-Mikulicz procedure a longitudinal incision of 2 to 5 cm is made across the pylorus, which is then sutured transversely (Fig. 3.5). Figure 3.5. Heineke-Mikulicz pyloroplasty. (A) A longitudinal incision is made across the pylorus, which is then sutured transversely (B). The postoperative appearance is variable, especially if the normal anatomy of the pyloroduodenal region is deformed from fibrosis and/or edema, and it is often difficult to distinguish postoperative deformity from recurrent ulcer. It has been noted that peristatic activity in the pouches can be observed fluoroscopically, and therefore pouches can be differentiated from ulcers on this basis . 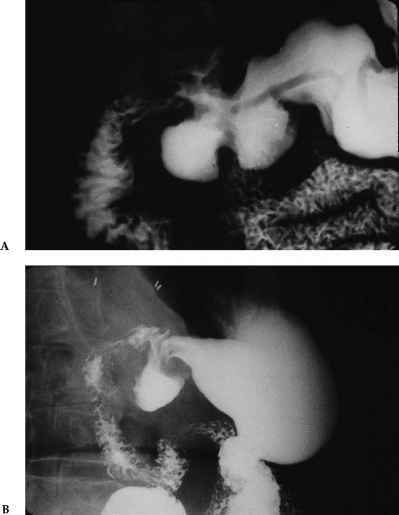 A characteristic pseudodiverticulum appearance on both sides of the pyloric channel, which has been called a "beagle ear sign," may be identified (Fig. 3.6) [8,12]. The effect of the Heineke-Mikulicz pyloroplasty was studied theoretically and confirmed by cadaver and clinical studies by Toye et al. . These authors hypothesized that the effect of the suturing would be to produce a pouch at the site of the suture line and traction on the longitudinal muscle fibers at either end of the incision. The traction produces a "sling" proximal and distal to the pouch. A ridge is formed by the pyloric muscle in the middle of the pouch. The longer the incision, the greater the size of the pouch and constrictions. The Finney pyloroplasty, an incision followed by suturing in the form of an inverted U extending from the antrum across the pylorus into the duodenum, produces a characteristic ridgelike deformity with a wide pyloric channel. The Jaboulay pyloroplasty is a gastroduo-denostomy with an anastomosis created between the antrum and second portion of the duodenum. This type of procedure is considered when severe scarring and deformity of the bulb renders the other procedures technically difficult. In some cases, gastric and duodenal ulcers may be treated with simple closure or local excision. 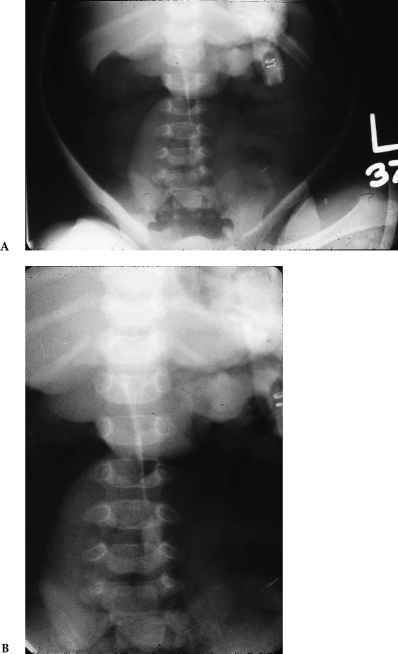 Plication defects may be identified in such circumstances, although often no radiological abnormality can be detected. Minor irregularities or deformity of the gastric or duodenal wall may be identified in some cases, and these may disappear with time . 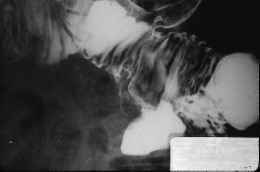 Wedge and sleeve resection of the gastric wall leaves a permanent deformity that can be identified on barium studies.